Well it’s official: the 30th American Cheese Society annual conference and competition is now on the books as one of the biggest (and do I daresay best?) cheesy shindigs in the history of cheese nerd conventions. Ever. With nearly 1,000 cheese geeks from across North America descending upon Madison, Wisconsin this past week to talk, eat and sell cheese, most everyone is now on their way home or has made it to their final destination with their bellies full of cheese and their briefcases full of business cards. And let me just say that after spending the past 15 months planning 32 seminars, 5 tours, numerous special events and a grand Festival of Cheese featuring nearly 1,800 different cheeses for the tasting, co-chairs Bob Wills, Sara Hill and I are ready for a nap. But before I nod off, let’s share a few photo highlights of the week. Here’s my cheese-sister-in-crime Sara Hill after being inducted into the prestigous Guilde Internationale Des Fromagers. Check out the website – it’s in French – so you know it’s important. Sara has worked 30 years in the cheese industry and deserves this honor. Congrats, Sara! Next, let me be the first person to tell every retailer in the nation that you need to carry the new Savory Spoon Panforte, which debuted at Saturday night’s Festival of Cheese. Featuring locally sourced cherries and honey, along with the traditional nuts which made this 15th Century Italian dessert famous, the Door County, Wisconsin version crafted by Janice Thomas can be cut to order or sold in small, gift wooden boxes sourced from France. Two words: super yummy. Contact eatpanforte@savoryspoon.com to order. But probably the happiest cheesemaker to win a ribbon may have been Martha Davis Kipcak maker of Martha’s Pimento Cheese. When Martha’s Pimento Cheese with Jalapenos was announced as the second place winner in the Cold Pack Cheese and Spreads with Flavor Added category, she almost couldn’t stand up in shock. But you should have seen her face when the announcer proclaimed she had also taken FIRST in the category with her original Martha’s Pimento Cheese. For someone who’s been in the food industry for 15 years, but only making cheese for less than a year, this is a well-deserved honor. Congratulations, Martha! Before the conference proper started, ACS goers had their pick of five different tours featuring Wisconsin dairy farms and creameries. I had a blast planning and leading the Driftless Tour of Wisconsin Sheep and Goat Dairies, visiting Dreamfarm in Cross Plains, Hidden Springs Creamery in Westby, and Nordic Creamery in Westby. With a local-foods lunch catered right on the farm and a perfect blue sky, this particular tour showcased the best of Wisconsin. Thanks to Sarah Bekkum for leading the tour at Nordic Creamery! Thanks to Brenda Jensen (first in line!) for leading us through her amazingly beautiful dairy sheep farm and creamery. And thanks to Diana Murphy for showing us her goat farm and creamery! … and the first-ever cheese curd tasting session! Of course there were also more traditional seminars, such as a 90-minute educational session on the flavor profiles of Comte. My favorite event is always the Meet the Cheesemaker, where this year, 70 cheesemakers from across the nation and Canada lined up their wares for show and tell. Of course some cheesemakers, such as Cesar and Heydi Luis are more photogenic than others. Say cheese! The weather could not have been more perfect to welcome members of the University of Wisconsin marching band to the Monona Terrace rooftop, where the Wisconsin Milk Marketing Board threw the mother of all opening conference parties, complete with a toe-tapping band, picnic-style food, mounds o’cheese and of course, free beer. This is Wisconsin, after all. 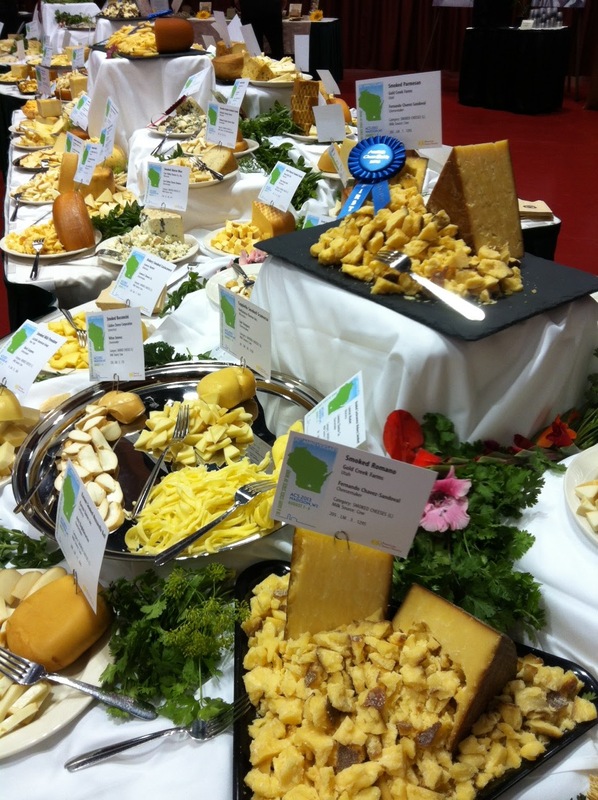 The conference proper wrapped up Saturday night with the annual Festival of Cheese, where Best in Show winner Winnimere from Jasper Hill Farm was featured (thanks to Mateo for having three cases overnighted to the festival so everyone could have a taste)! 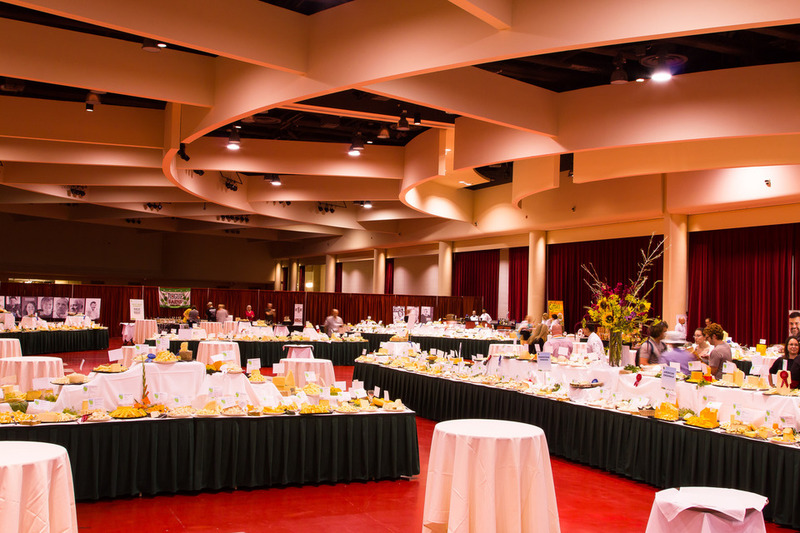 And, well, every kind of cheese filled a room to hold 1,200 attendees. Many, many thanks to the hundreds of volunteers, ACS staff, cheesemakers and all attendees for helping make the 30th ACS so memorable. See you next year in Sacramento, California, July 29 – August 1. This was my second conference and am fascinated with cheese people! Congrats, it was great.